When we were in Korea last fall, we had mooksabal, acorn tofu noodle soup for the first time and fell in love with it instantly. We had had acorn tofu (dotori mook) before but never seen a noodle soup made with it. When we first read about it, our reaction was how can they make noodle with acorn tofu?! (For those who are wondering how they make tofu out of acorns, check out this wikipedia site.) So we were very anxious to try it. We had arrived in the Incheon Airport the night before. We rented a car from the airport and drove to Yanpyoung, a small rural/resort town just east of Seoul. We picked Yanpyoung as our first destination because it is not too far from Seoul and is en route to the East coast - we planned to visit the East coast this time since we toured the west and south coasts during our last trip. 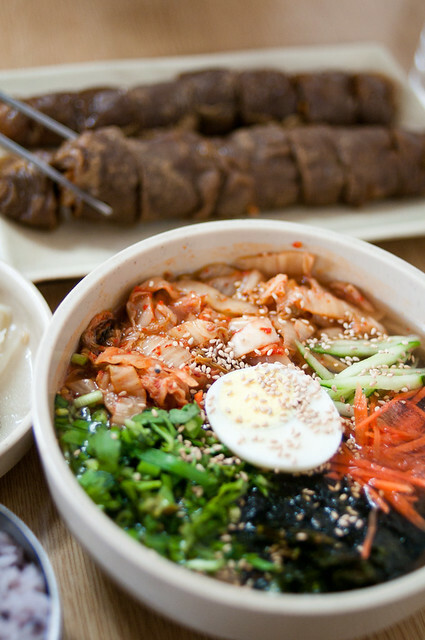 Yanpyoung is also quite famous for a wide variety of epicurian dining options like wild vegetable bibimbap, azuki bean porridge, Hanwoo (Korean beef) BBQ, etc. Among many, acorn tofu noodle soup is a popular must-try dish in the area. We drove around the town taking pictures until the restaurant opened. 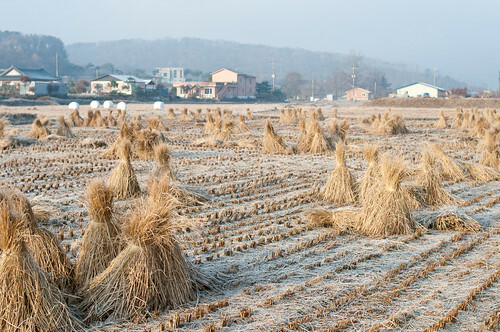 Though Yanpyoung is only 40 miles from Seoul, the air in this part of the country was so fresh that I could feel the crispy winter air deep in my lung. It was quiet and peaceful here except for sounds from roosters and dogs. The streets were empty except for heavy morning fog which engulfed the whole town. We were the first customers when the restaurant finally opened. 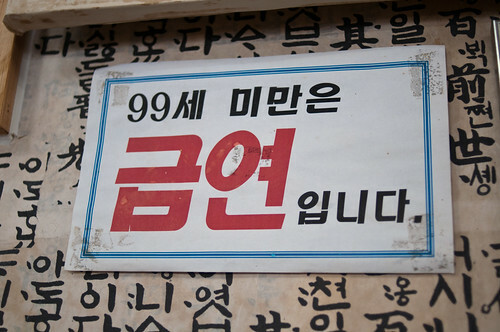 We sat on the heated floor where a sign was hanging which read "NO SMOKING FOR 99 YEARS OLD OR YOUNGER." The menu was very simple with only a handful of items which were all made with acorns in some form or another, including acorn pancake rolls, acorn tofu noodle soup, acorn tofu bibimbap, and so forth. We ordered the pancake rolls and noodle soup. They were filled with strong nutty flavors of acorns, and needless to say, were very delicious. After we came back to the States, we set a plan to replicate the meal with the acorn flour we have at home. I did some research online and finally made it. 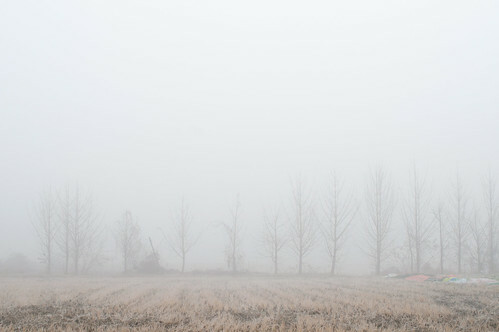 The memories of heavy morning fog and snow-covered pastoral landscape of Yanpyoung came back along with the first bite of home-made acorn noodle soup. You can buy the tofu directly from a market or make it from scratch using acorn flour like I am doing here. If you are using acorn flour, mix 1 cup of acorn flour in 6 cups of water with a dash of salt and then boil over low to medium heat for 20 minutes stirring constantly. You don't have to cut acorn tofu to look like real noodles. Cut thin, long and flat. 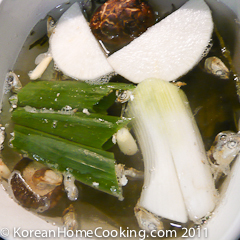 Make anchovy broth by boiling anchovies, kelp, a piece of daikon radish, Korean leek, and dry shitake over high heat at first. 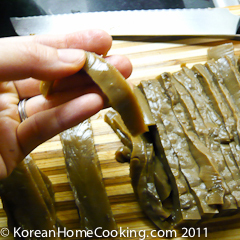 Once it starts boiling, take out kelp, add Korean soy sauce and then boil over medium heat for about 20+ minutes. 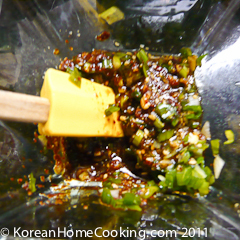 Make seasoning sauce by mixing all the ingredients above. 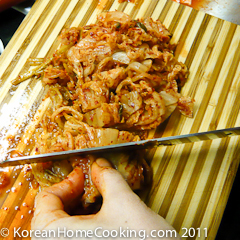 Chop kimchi into small pieces (since they are going to be topping) and season with a dash of sesame oil and ground sesame seeds. 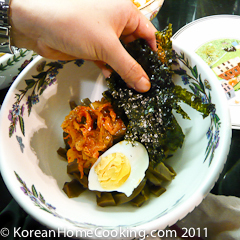 Place the acorn tofu noodles (from Step 2), followed by a half of hard boiled egg and seasoned kimchi (from Step 5) and shredded roasted seaweed. Add sliced or julienned cucumber if available. Pour the anchovy broth from Step 3 over the noodle pile. Add the seasoning sauce (from Step 4) to your taste right before serving. You can serve it chilled or hot. You can also serve it with steamed rice. Wooooow.. I miss it so much! Your dish looks absolutely amazing! I've never heard of this, but it looks really good. I'd love to try it chilled in the summer. @Juhee - thanks! 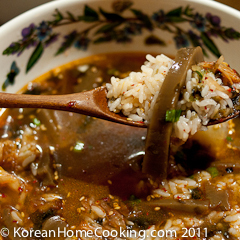 @Renee - the word "mooksabal" (=acorn tofu noodle soup) is a popular Korean expression for saying "messed up". So, the name of this dish should be quite familiar (?) 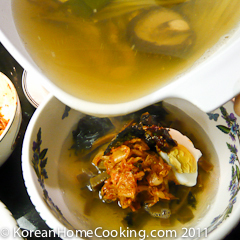 to many Korean-speaking people, but as you say, not many people have seen or eaten this dish. We just had a bowl of chilled mooksabal a few weeks ago again and it was delicious. I think it's a perfect summer soup. I am always very cautious about trying new food, especially when it comes to a whole new cuisine. But those photos looks delicious so I think I would give it a try. Thanks a lot for posting. Seems like a very interesting recipe. I myself don't like Korean cooking much - too spicy. But my husband is a huge fan so I always try to surprise him with the new recipes. Thank you for posting it!